Chickens are a popular backyard path to a sustainable lifestyle, even in urban areas. The gentle clucking as the chickens happily scratch about in their pen is a peaceful addition to the hustle and bustle of everyday life. 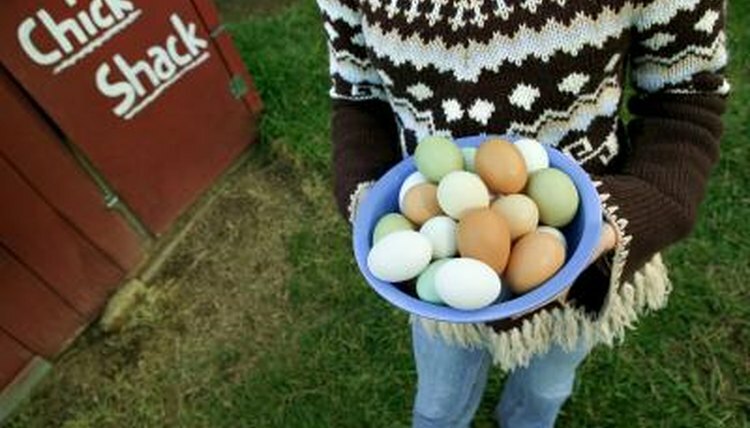 As the days of summer fade into winter, egg production decreases. To stimulate egg laying, the essential ingredient is light. Chickens require 14 to 16 hours of light daily to produce eggs. Install a shop light on the ceiling of the hen house, following the manufacturer's instructions. Place the fixture as high as possible to prevent the hens from sitting on top of it. Run the cord along a rafter and down the wall, covering it with a raceway-type cord cover. The cover will keep the cord in place and prevent the chickens from pecking at it. Plug a timer with a photocell light sensor into the wall outlet. Set the timer for a 16 hours a day, ending at dusk. On dark winter days, the light may remain on all day, but on bright sunny days, the light sensor shuts the fixture off, saving energy. Monitor the chicken's water source carefully. Even a few hours without water affects the chickens' ability to lay eggs for days and sometimes weeks. Chickens should always have clean water available. Feed the chickens a diet that includes 16 percent protein. Layer feed is a balanced diet intended for egg-laying chickens; it provides the necessary protein, carbohydrates and other nutrients necessary to maintain the chickens' health. Heat the hen house in cold weather. Trying to stay warm uses energy that the hens could otherwise put into egg-laying. Keep calcium carbonate and granite grit available to the chickens. Supplemental calcium helps the hens produce eggs with hard shells. Grit is necessary for the chickens to grind their food, making it easier to digest.  Setting the timer so the 16-hour day ends at dusk allows a gradual transition from light into night.  A rooster is not necessary for egg production.  Adding a small amount of scratch mix to the hens' diet satisfies their urge to scratch about in the enclosure. ⚠ Always plug electrical cords into a GFCI-protected outlet to prevent electrocution. ⚠ Avoid exposing pullets younger than 16 weeks to increased light in winter; it will stimulate the egg-laying process in the immature hens. Oregon State University Extension: Why Did My Chickens Stop Laying? University of Kentucky Cooperative Extension Service: Why Have My Hens Stopped Laying?